A total of 3,000 special edition PETRONAS x Shopee preloaded RM50 gift cards will be available online beginning 9 September, priced at only RM45 (inclusive of free shipping). PETRONAS Dagangan Berhad (PDB) has now entered into the e-commerce space with the launch of its first online store with Shopee, Southeast Asia and Taiwan's fastest growing e-commerce platform. 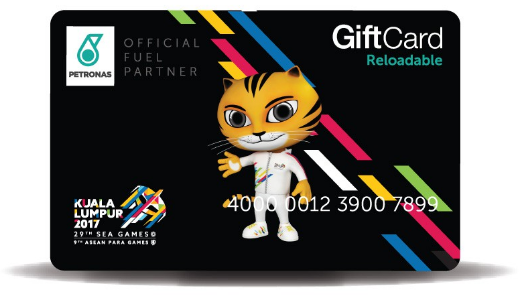 With this collaboration, Malaysian shoppers can now buy PETRONAS fuel gift cards online and exclusive SEA Games merchandise at discounted rates, with free shipping throughout Malaysia. "Malaysia boasts 15.3 million online shoppers and we are very excited to be in the e-commerce space. The collaboration with Shopee supports our aim to be an omni-channel retailer and provide greater accessibility to our customers. Today's shoppers want ease and unique experience, and that is what we want to deliver to our customers," said Aadrin Azly, PDB Head of Retail Business. "This new digital platform complements our brick-and-mortar stores, enabling us to reach out to a wider customer base," he added. "The current offering is just the beginning - we are already planning for more items to be sold in the near future so continue to watch this space!" A total of 3,000 special edition PETRONAS x Shopee preloaded RM50 gift cards will be available online beginning 9 September, priced at only RM45 (inclusive of free shipping). Customers may also opt to purchase these cards at 300 selected PETRONAS stations in October for RM50 each and receive a RM5 Shopee voucher. In commemorating the 2017 Formula 1 PETRONAS Malaysia Grand Prix final edition in Sepang this 29 September to 1 October, the official F1 merchandise will also be sold at a discount exclusively on Shopee closer to the race date. "We are excited to welcome one of Malaysia's most iconic brands on board the Shopee platform. Malaysians can expect exciting offerings in the near future from PETRONAS on Shopee, as we work together to drive greater synergy between e-commerce and PETRONAS stations nationwide," said Ian Ho, Regional Managing Director of Shopee. To find out more about PETRONAS' latest offerings on Shopee, visit here.